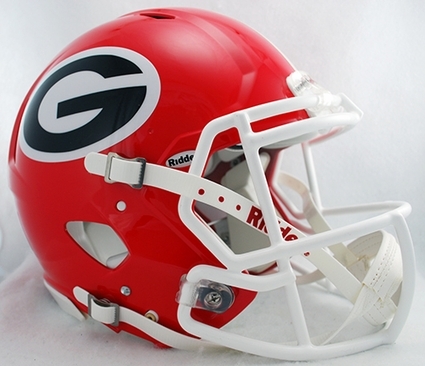 The Georgia Bulldogs Riddell Revolution Speed Authentic Helmet is just like the college players wear! This is an officially licensed Riddell helmet that measures authentic size and weight with a complete interior pad set. The Georgia Bulldogs Riddell Revolution Speed Authentic Helmet has taken the football world by storm - and now, the speed helmet is available as a licensed authentic helmet. With a distinctive, aggressive shell design, the speed helmet is being adopted by premier athletes at a furious pace. Perfect for autographs and looks great on the shelf, order your Georgia Bulldogs Riddell Revolution Speed Authentic Helmet today!